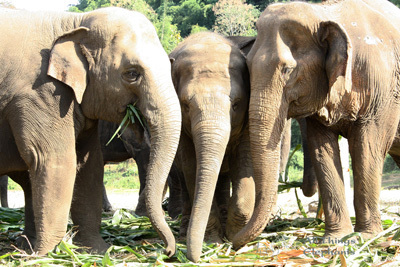 Elephant Nature Park is a sanctuary for elephants located in the beautiful Mae Taeng valley, near Chiang Mai. The park was founded by Sangduen Chailert, better known as Lek, an award winning conservationist who has become a powerful voice for the welfare of elephants in Southeast Asia. Lek rescued the first elephant, Mae Perm in 1992. By 2003, Lek had rescued nine elephants and with the help of donations was able to purchase land along the bank of the Mae Taeng River, where Elephant Nature Park stands. Since then the park has continued to expand and is now home to more than 40 elephants, many who have suffered greatly in the past. Elephants in South East Asia are commonly employed in activities that are both physically and psychologically harmful, including street begging, performing in shows, logging as well as being ridden while sick or pregnant. Many of the elephants at the park were rescued from a hard life where they often sustained permanent injuries. The herd at the park includes blind, crippled, orphaned, and ‘senior’ elephants, who now live a peaceful, dignified life in a more natural environment. Motivated by a desire to free elephants from mistreatment, Lek has adopted a more evolved approach to caring for elephants by establishing a form of eco-tourism based on genuine interest, love and respect as opposed to exploitation. Elephants at the park are not required to work, are not ridden, do not perform tricks, and mahouts do not have elephant hooks, commonly used to handle elephants. During the day, elephants enjoy roaming the park, grazing in the fields, bathing in the river, playing in the mud pits, socializing with their friends and caring for their young. Over the past year, Elephant Nature Park has moved towards a chain free existence for the elephants, with several new shelters recently built that eliminate the need for elephants to be chained at night. Visitors to the park have the opportunity to witness the complex social behavior of elephants of various ages interacting in family herds that revolve around Yin Dee, Dok Mai, and Navaann, the three baby elephants at the park. It is fascinating to observe the loyal friendships that have formed over the years such as that between Jokia, a blind elephant, and Mae Perm, her constant companion and attentive guide. Elephants exhibit many of the same characteristics as people including playfulness, affection, lifelong bonds of friendship, highly developed communication, anxiety, jealousy, and maternal love. The park is also home to water buffalo, cows, cats, wild pigs, ponies, and many dogs who have been rescued over the years. As well as providing a safe haven for elephants, the park seeks to educate the public about the plight of the Asian elephant to ensure their continued survival and to advocate for their humane treatment. Elephant Nature Park has initiated several projects designed to improve the welfare of elephants throughout Thailand as well as Cambodia and Burma. It is hoped that as awareness grows, elephant sanctuaries based on the model of Elephant Nature Park will become common throughout the region and lead to a significant positive impact on the lives of Asian elephants.